Suppose a user wishes to recover yesterday’s version of their word document. How much would it cost to restore that one file a user? If you implement Volume Shadow Copy Services (VSS), then the user can recover the file themselves at no cost to you. Volume Shadow Copy is one of the least known features of Windows Server 2003. There are several names for this new service: Shadow Copy, Previous Version, Shadow Copy of Shared folders, Volume Shadow Copy. Let me help you get started with this wonderful service. In Windows Server 2003, each NTFS Volume or partition has its own Shadow Copy tab. Click on the root of the any drive, Select a Volume, now press the Settings button. Note that the diagram opposite displays the number of shares for each volume. This is a key point, Volume Shadow Copy will only operate on shared folders. If you need to make an instant Shadow Copy of your shares, just press the ‘Create Now’ button. The next step is to select the Settings button for the drive you want to configure, remember to change the shadow drive by using the Details button. When it comes to configuring Shadow Copy for file shares, always use a separate volume for the shadow. Where possible, use a different disk for performance and fault tolerance. The default timing for creating a Shadow Copy is twice a day at 7:00 and 12:00. If you are keen to get the most out of Shadow Copy, then analyze your users work habits and devise a better schedule. I would advise against going mad and creating too many copies. Bear in mind that that there is a limit of 64 shadow copies before the first one gets overwritten. Therefore part of your plan should be to calculate how long it would be before a copy is erased. I do like to work from my MMC or ‘Mission Control’, therefore when I need to configure Volume Shadow Copy, I go to the Shared Folder snap-in. The alternative route is to launch Computer Management and select Shared Folders. Like so many Windows 2003 features, Volume Shadow Copy operates as a service. You can check the settings through Administrative Tools, Services and verify that Volume Shadow Copy is set to Start Automatically. Seeking and zapping unwanted user accounts. Bulk-importing new users. Give this AD utility a try, it’s free! Download your FREE Active Directory administration tools. Next send a memo to your users explaining how to install the client. You could give step-by-step instructions on how to connect to the \\server \twclient share and install the client. Perhaps an even better idea would be to cut out the user and install twclient via a Software Group Policy. Incidentally, if anyone knows what TW in Twclient means, please email me. And Steve B did. TW stands for TimeWarp. Strange but true, Microsoft at their zaniest. 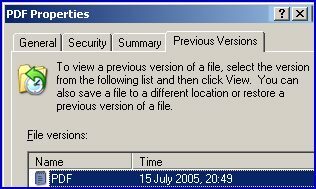 Finally, when your users at these XP clients wish to retrieve a previous version of a file, explain how to connect to the share on the server, and then select the ‘Previous Version’ tab from the file in question. Note: When testing make sure that you make a change in the file, otherwise File versions will be blank. In extreme cases this oversight can mean that you erroneously undo all the Volume Shadow Configuration. 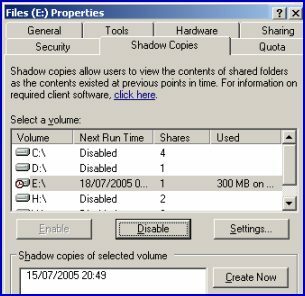 If you use Windows 2003’s backup (much improved over Windows 2000), always make sure Volume Shadow Copy is enabled. That way you can be sure that any open files will be included in the backup. Fortunately, by default, Volume Shadow Copy is selected, my advice is to leave the setting enabled. Shadow copy, or Volume Shadow copy Service (VSS) is one of the hidden jewels of Windows Server 2003, take the time to setup shadows on your file servers, and roll out the twclient via group policy. RAID – Which number for your data? UPS – Neglect at your peril!